Did you know that changing the time of day you take your thyroid medication may impact your thyroid function? Beyond the time of day, there are several factors that YOU can change which may result in an increase thyroid function and conversion in your body. 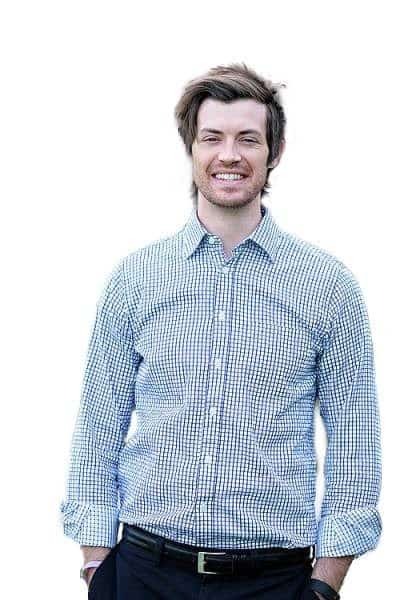 These changes have helped hundreds of patients of mine in the past and I'd like to share these strategies with you. Will Changing How you Take Levothyroxine Help with Weight Loss? Believe it or not, taking your thyroid medication correctly matters quite a bit. In the current treatment paradigm (where your total dose is based on your TSH) it becomes very important to ensure that you are getting enough thyroid hormone to your tissues. It turns out that the time of day you take your medication may influence how much of it is actually absorbed, how much enters into your body and how much thyroid hormone is converted. Conventionally you (and most thyroid patients) are told to take your medication first thing in the morning, on an empty stomach and wait at least 60 minutes before you eat any food. Well, it turns out that there are several factors at play here that may change how much thyroid hormone you absorb and how your body interacts with that thyroid hormone. As we've established in other posts, thyroid hormone interacts with many other hormones in your body including cortisol levels (1). One thing you might also be familiar with is that cortisol levels are supposed to peak at 8am each morning (2). ​Since we know that both of these hormones interface with one another (and alter the effects of each other) taking your thyroid medication in the morning may be increased demand on adrenal and thyroid function. Unfortunately, many hypothyroid patients also suffer from debilitating fatigue which may be due to dysregulated cortisol levels. In addition, it turns out that your GI tract and how quickly it moves throughout the day also may influence thyroid absorption. We know that approximately 70% of thyroid hormone is absorbed (assuming you have no GI issues). We also know that GI function slows down at night (3) and speeds up in the morning (explaining why most people have bowel movements in the morning). ​Therefore it just makes sense that taking thyroid medication at night may be better for some individuals based on these two factors alone. For patients who have cortisol related issues (meaning high or low cortisol) or who suffer from GI-related problems - it may actually be better to take your thyroid medication at night. Does this mean that you should take your thyroid medication at night? It turns out that some studies have shown that simply taking your thyroid medication at night (4) may improve all of your thyroid serum tests. ​What's really interesting about this study is that it showed not only do T4 levels increase but T3 levels also increase. In fact, we really only care about T3 levels because T3 is the ACTIVE thyroid hormone. 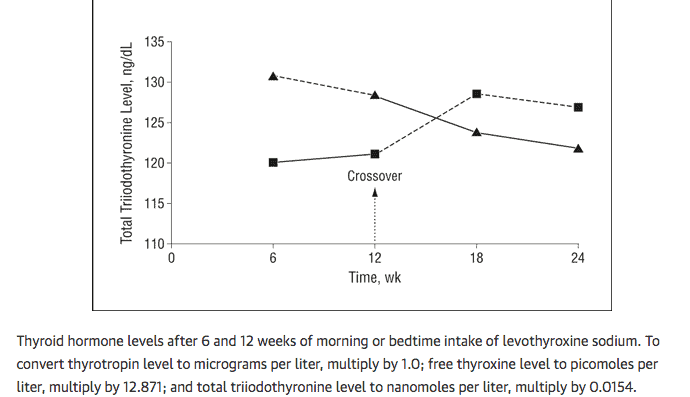 So why does taking your thyroid medication at night seem to result in an increase in T3 levels for some patients? Again, this probably comes back to hormonal rhythms and changes that you undergo on a daily basis. In a world where most physicians are reluctant to increase your dose of thyroid hormone, it's helpful to understand what you can be doing to help improve your thyroid absorption and function whenever possible. To ensure proper absorption make sure to take your thyroid medication away from meals, supplements and anything else by mouth. If taking your medication in the morning doesn't work well for your schedule then consider taking your medication prior to bedtime. Avoid taking thyroid medication anywhere near iron or calcium as these may further reduce absorption of thyroid medication. If you have any gastrointestinal issues make sure to manage those appropriately, that means any of the following conditions: GERD (or reflux), SIBO/SIFO, constipation, gas/bloating, IBS, IBD or abdominal pain. Remember that certain forms of thyroid hormone are absorbed better than others: the fewer fillers that the medication has the better it will be both tolerated and absorbed. NDT may be more difficult to absorb for some patients with GI-related problems. Use these rules as guidelines for taking your thyroid medication. The answer to this question isn't necessarily an easy one, but we will talk about how it might help you. Obviously, the value of increasing your T3 + T4 levels simply by changing when you take your thyroid medication is very promising. But, does this effect change your metabolism? Several issues are involved in why some thyroid patients lose weight and others don't and I've written about it in detail here. Basically, as long as your body is converting T4 to T3 adequately then increasing your absorption may improve your metabolism and lead to weight loss. When we talk about thyroid function and weight gain you need to understand that the majority of the benefit from taking thyroid medication comes from its influence on your basal metabolic rate (5) and other hormones. ​So for some of you, increasing your thyroid medication may result in an increase in T3 which may result in an increase in metabolism. ​The good news is that making this change is relatively easy to do. When it comes ​to taking T4 only thyroid medication there are a couple of other factors you can consider to increase absorption and improve thyroid function. Since T4 (levothyroxine & Synthroid) are the most commonly prescribed thyroid medications it's important to put emphasis on these medications. This is particularly true if you are experiencing any negative symptoms. 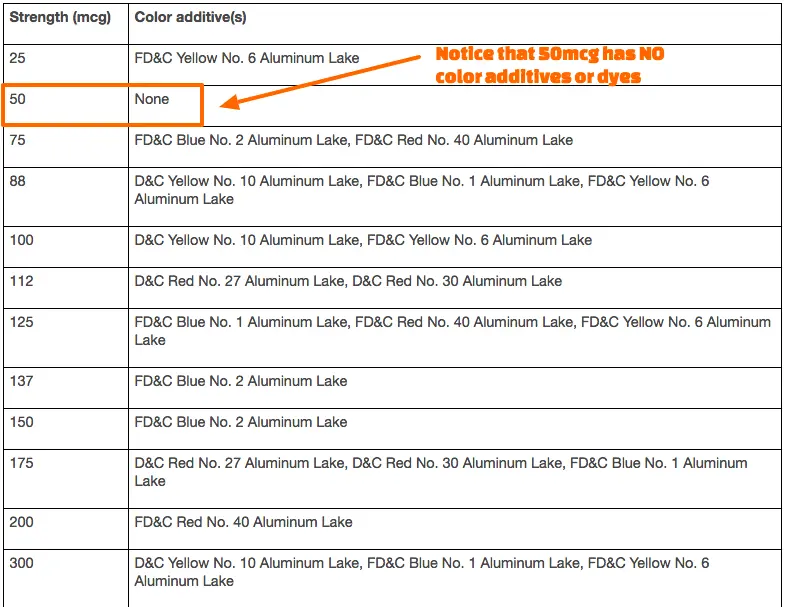 Believe it or not, levothyroxine is filled with inactive fillers and dyes. These fillers and dyes can reduce the absorption of thyroid hormone (by making it harder to break down) and they can also cause negative reactions by themselves. Many patients experiencing persistent hypothyroid patients may actually be reacting to fillers or dyes inside of their thyroid medication. This is where the 50mcg tablet of levothyroxine steps in. ​The 50mcg tablet of levothyroxine has no additives or fillers which means it can potentially help hypothyroid patients. The best way to do this is to supplement up to your current dose of levothyroxine using 50mcg increments. So if you are taking 150mcg of levothyroxine you would simply switch to 3 tablets of the 50mcg levothyroxine dosage for a total of 150mcg. This doesn't change your total dose, it just changes how you get to it. I've written in the past how Tirosint may be the best T4 only thyroid medication and for good reason. 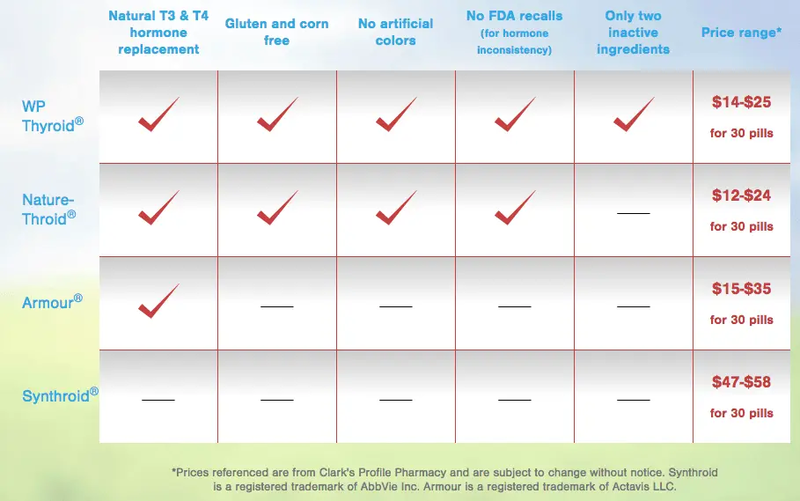 ​Tirosint is a T4 only thyroid medication that contains 3 inactive ingredients and 1 active ingredient (levothyroxine or T4). Many patients report that switching from levothyroxine/Synthroid to Tirosint has significantly reduced their symptoms and has helped with weight loss. This likely has to do with the increased absorption (due to reduced fillers) and therefore more thyroid hormone in the body. Switching to Tirosint is an option for many patients because most endocrinologists and PCP's are willing to prescribe T4 only medications over T3 preparations and Tirosint is a T4 only medication. Another big downfall to T4 only thyroid medication is dosing. Many hypothyroid patients are treated based on their TSH which is inaccurate for many reasons. This results in sub-optimal thyroid levels in the body and persistent symptoms of hypothyroidism. To ensure that you are getting the right amount of thyroid medication in your body you may actually need to increase your dose. This is especially true if you have concurrent GI-related issues that may be reducing absorption. You can use this levothyroxine dosage guide to help you determine if you are indeed on the right dose. Another consideration is simply changing your dosing schedule of thyroid hormone. Switching to a nighttime dosing schedule of your current thyroid medication may result in an improvement in symptoms for the reasons mentioned above. ​Natural desiccated thyroid includes a combination of T4 and T3 thyroid hormone (in addition to other thyroid hormones). Many patients report feeling better when switching from T4 only thyroid medication to NDT (6) and this likely has to do with the addition of the T3 in this medication. NDT, like other thyroid medications, contains additives and fillers. Your symptoms may be due to reduced absorption or an interaction with some of these fillers. If you are experiencing these symptoms you might consider switching from whichever NDT you are currently taking to WP thyroid. WP thyroid contains the fewest inactive ingredients when compared to other thyroid hormone formulations. ​Increasing absorption of T3 is particularly important for weight loss and you can read a case study here about how using WP thyroid can help with weight loss. It has been more difficult to get both WP Thyroid and Nature-throid lately, so switching to an alternative like NP thyroid may be your only option. NDT​ may be difficult for your body to break down which means that you need a proper functioning GI tract to increase absorption. If you are experiencing any of the GI-related symptoms (listed above) make sure to get your GI tract evaluated and treated if necessary. Treating your GI tract will not only improve your absorption it will also increase your T4 to T3 conversion a﻿s wel﻿l (7). Patients with a known diagnosis of Hashimoto's or autoimmune thyroiditis should be mindful when taking NDT. NDT is porcine sourced which means that inactive parts of this medication may have antigenic properties in the body. What this means for you is that you may react negatively to the medication, especially if your immune system is compromised. Your body may react negatively to the thyroid medication and you may feel worse (in addition your antibodies may increase as a result). If this happens to you make sure that you cool off the inflammation and treat any GI-related issues prior to attempting the medication again. Like other forms of medication containing T3, you may benefit from splitting your dose throughout the day. This is not because of serum T3 levels, but instead, it's because of how your heart tissue interacts with T3. T3 is the strongest thyroid medication which means it is also potentially the more dangerous of thyroid medications. Many patients taking T3 containing medications like Liothyronine and Cytomel tend to experience heart palpitations and or tachycardia (rapid heart rate). Immediate release forms of T3 like liothyronine and Cytomel tend to have the most symptoms associated with their use but they are also the strongest medications. Part of this reason has to do with the rapid absorption of T3 in the body and the rise in serum T3 levels about 2-3 hours after taking the medication. This immediate release usually results in better tissue levels throughout the body but can also come with many side effects. If you experience heart palpitations and a rapid heart rate, then switching to sustained release T3 may be a better option for you. The reason SR T3 is sustained release is due to the methylcellulose fillers (8). This acts as a glue which slows down absorption in the GI tract and therefore reduces the spike in serum levels after ingestion. The problem with potentially switching to SR T3 is that you need a functioning GI tract to properly absorb this medication. Conditions like low stomach acid or SIBO will reduce absorption and potentially cause problems. If you are taking SR T3, make sure that you have your GI tract evaluated properly, especially if your dose doesn't seem to be working. There are many tips and tricks that you can use to improve your symptoms of hypothyroidism and improve your thyroid function. Some tips are intuitive like making sure you take "cleaner" thyroid medications, and others are less intuitive like taking your thyroid medication at night. Whatever thyroid medication you are using you want to make sure that you are absorbing and converting your thyroid hormone properly. Use the tips in this article to help guide you but realize that each person is different. Have you changed the way you take your thyroid medication?